Packages must be prepared by an employee who is trained and certified in specimen transportation to ensure compliance with Department of Transportation (DOT) and International Air Transport Association (IATA) regulations. Anyone performing a function that causes a hazardous material to be placed in public transportation is required to be trained in accordance with the Code of Federal Regulations (CFR) Title 49, part 172.704. Cleveland Clinic Laboratories offers online courses for those in need of training and certification in specimen transportation. Please contact your sales representative for more information. If you have any questions or concerns, please contact Client Services for assistance. Specimens are only acceptable for processing when they are collected and submitted in the appropriate containers. If you have any questions on what type of container to use for a particular test or specimen, please refer to the specimen requirements on our online Test Directory or contact Client Services. Shipping supplies, specimen containers, transport media, and more are available through the Supply Storefront. When transporting a specimen in a bag, use either a labeled temperature-specific bag or a clear bag with a label indicating the temperature requirements. Bags with no indicators on them will be treated as room-temperature/ambient specimens. 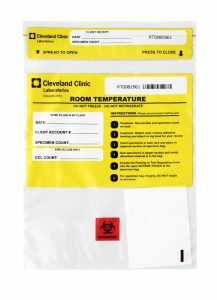 Specimen bags and temperature labels can be ordered online through the Supply Storefront. Be sure to also include an absorbent sheet in any submitted bags to control any condensation or possible specimen leakage while in transit. 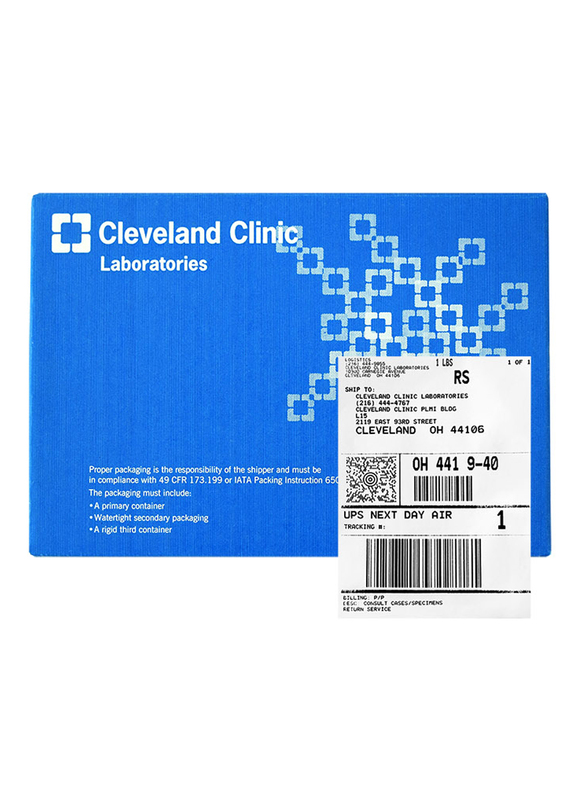 Specimens sent to a different Cleveland Clinic address are subject to significant delays in processing and may be at risk for specimen integrity problems. For more information, please see our Shipping Information section. Specific specimen volume requirements for each test are provided in our online Test Directory. If you have concerns about a lower volume of a specimen being submitted, please contact Client Services to discuss the test and specimen. A laboratory representative can advise you whether an alternative technique is available that can accommodate the available specimen volume. When a specimen is submitted to our laboratories with inadequate volume, the test will be canceled and indicated as “QNS” (Quantity Not Sufficient). The laboratory will store the QNS sample and contact the client to request that the specimen be recollected. All specimens must be labeled with 2 unique patient identifiers. If a requisition is sent with the specimen, then the 2 unique patient identifiers on the requisition and the specimen container must match. This information will ensure positive identification and optimum integrity of patient specimens from the time of collection until the completion of testing. If a specimen is inappropriately or completely unlabeled, the client will be notified and the order will be canceled. Questions? Please contact Client Services if you need additional assistance.